As a society we may need to rethink using the phrase “you dirty rat” as a putdown. Rodents have gotten a bad rap what with their role in advancing the bubonic plague across Europe back in the 1300s and all. But it may be time for us to forgive and forget. Come on, we’re in a whole new millennium now. Let’s let bygones be bygones. I don’t work in a lab, so it’s hard to fathom how many ways rats have helped advance our society and humanity in the field of medicine. Scientists from around the globe are now working together to take that to a new level based on the rodent’s brain and its bristly whiskers. It seems the furry little creatures use those long hairs protruding from their snouts to gather more information when they navigate in the dark than we ever originally imagined. Research shows a rat’s whiskers are more sensitive than a human’s sense of touch in their fingertips, pulling in data from three dimensions. 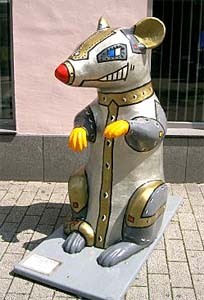 That info and the way it’s processed is being translated into a robotic “rat” with the anticipation that it will be functional in rescue missions where visibility is minimal. The iconic Mickey Mouse and super chef Ratatouille may soon have to move over in the Rodent Hall of Fame to make room for Robo Rat, hero.